Without a financial forecast, your business plan is incomplete. The three basic parts of your financial forecast should include your pro forma income statement, estimated balance sheet, and projected cash-flow statement along with the business assumptions behind your projections. They should look similar to the examples shown here. Review and revise your forecasts on a regular basis. Spell out what’s behind the numbers, because the assumptions you make are just as important as the financial forecast itself. If you’ve been in business for a while, get together past income statements to serve as a starting point in making future projections. If you’re just starting your business, you won’t have a financial history to fall back on. Instead, search out people in similar businesses, go to trade shows, do online research, and find consultants who can give you guidance. It’s work, but if your financial projections end up close to the mark, the results will definitely be worth it in the end. 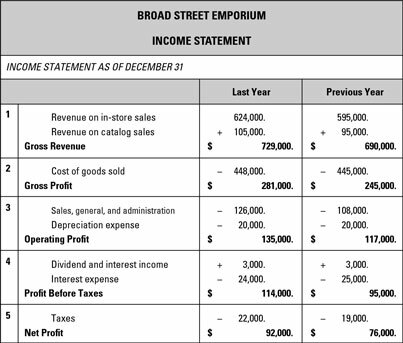 To assemble your estimates, think about using the company income statement format shown in the following figure. That makes comparing your projections for future performance with what really happens easy. At the end of each quarter or year, take time to go back to your pro forma income statements to compare actual financial performance with projected performance. Make notes indicating where you were right and wrong. After all, practice makes perfect. The difference between an estimated balance sheet and the real thing is that the estimate projects what you will own, what you will owe, and what your company will be worth year by year — looking ahead four or five years. Projecting those numbers sounds tough, and it is. But do it anyway. Even if your projections prove to be less than perfect, they provide you with a financial road map to the future. Start by listing the assets you think you’ll need to support the growth you’re looking forward to. Then think about how you’ll pay for those assets, and that means making major decisions about how much debt you’re willing to take on, what company earnings you’ll be able to plow back into the business, and how much equity you need to invest in the future. 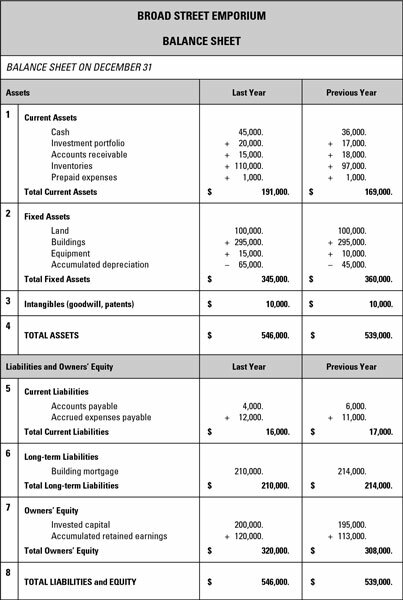 The sample balance sheet here provides a useful format that works just as well projecting the future as it does your current condition. Anticipate inventory purchases to meet seasonal business cycles. Take advantage of discount- and bulk-purchasing offers. Plan equipment and building purchases to meet your growth needs. Arrange financing if you’re going to need it — whether that means recruiting investors, assuming long-term debt, making a personal loan, or establishing a short-term line of credit with your bank. Stay in control of your finances by anticipating cash needs before they arise and meeting obligations in an organized, timely way. 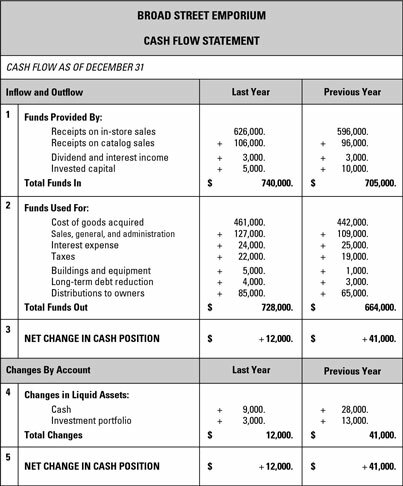 When you estimate your future cash needs and sources, use a template like the company cash-flow statement shown in the figure. That way, later you’ll be able to compare your projections with your actual cash-flow statements. This format allows you to look ahead over the next two years. If appropriate, you can expand the form to look even farther ahead. Many large companies do five-year cash flow projections. Cash reserves are one important way businesses plan to weather economic storms. They contain the money you can draw on to meet operating expenses in case of a shortfall in revenues. When business is going well, it’s always wise to build up your cash reserves. When you start a new business, many experts advise that you have a reserve equal to at least six months of your projected expenses. The more conservative you are in your projections — and the more cash you can set aside — the stronger your position in the event of a downturn.